Peete won 12 times on the PGA Tour, mainly on the strength of his uncanny accuracy off the tee. 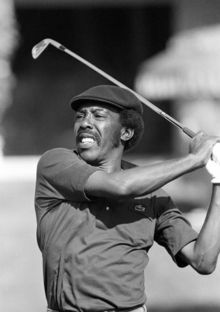 Peete led the PGA Tour in driving accuracy for 10 straight years starting in 1981, and he captured the Vardon Trophy over Jack Nicklaus in 1984. He also played on two Ryder Cup teams. More impressive than his record, however, was the journey to compete — and beat — the best in golf. Born July 18, 1943, in Detroit, Peete used to pick beans and corn in the fields in Florida to make money for his family. He eventually financed a station wagon from which he sold vegetables and other goods to migrants. He wasn't interested in golf, even at the prodding of friends. Peete had spent enough time in the hot sun. According to a 1983 profile in The New York Times, Peete became interested when he saw how much money golfers were making. He first took up the game in Rochester, New York, when he was 24. Within six months he was breaking 80, and a year later he was breaking par. Even more remarkable is that Peete had a left arm he couldn't fully extend. He had fallen from a tree and broken his elbow as a kid, and it was never properly set. That didn't keep him from developing a repeatable swing that always seemed to find the fairway. "Some of the players still drive farther than I do," Peete told The Times in the 1983 profile. "But I'm always in the fairway, and they're sometimes in the trees." Peete became the fourth black player to win on the PGA Tour, joining pioneers like Pete Brown, Charlie Sifford and Lee Elder. Four years after finally earning a card, he won the Greater Milwaukee Open in 1979 by five shots over Lee Trevino, Victor Regalado and Jim Simons. He finished 27th on the money list that year and cracked the $100,000 mark ($122,481) for the first time. Peete won four times in 1982, tied for the most titles on the PGA Tour that year with Tom Watson and Craig Stadler. He won the Vardon Trophy for the lowest stroke average in 1984, and his biggest victory was a year later when he captured The Players Championship. "I can still remember watching Calvin hit drive after drive, straight down the middle of the fairway, an amazing display of talent he possessed despite some of his physical limitations," PGA Tour Commissioner Tim Finchem said. "Calvin will always be remembered as a great champion and an individual who consistently gave back to the game. We will dearly miss him." Peete finished his career with over $3.2 million in earnings from the PGA Tour and Champions Tour. He was inducted into the African-American Ethnic Sports Hall of Fame in 2002. He also had a degree. A few years after his first PGA Tour victory, he returned to Detroit to take the General Equivalency Diploma test. "I love this game," Peete said in the Times profile. "You're out in the fresh air and you can meet good people, like the President of the United States — I once played a round with President Ford — and you have a chance to make $400,000 a year." Two years later, the season he won The Players Championship and the Phoenix Open, he earned $384,489 to finish fourth on the money list. Peete is survived by his wife, Pepper, and seven children.